Stepping into the main territory, Kenny slowed his footing. Getting into full view of the den, he smiled and inhaled the familiar scent. Looking around he saw Siren waving his nape back and forth, the brute looked around once again and saw Macy checking around. He didn't seem to find Sharon, Amber or Veleno, "Are they still exploring?" mumbled Ken. He wondered if he should go find them, he may not know the wolves that well, but he can still sense Sharon's familiar scent around the air particle. "Nah I'll leave them alone some more" thought Ken. 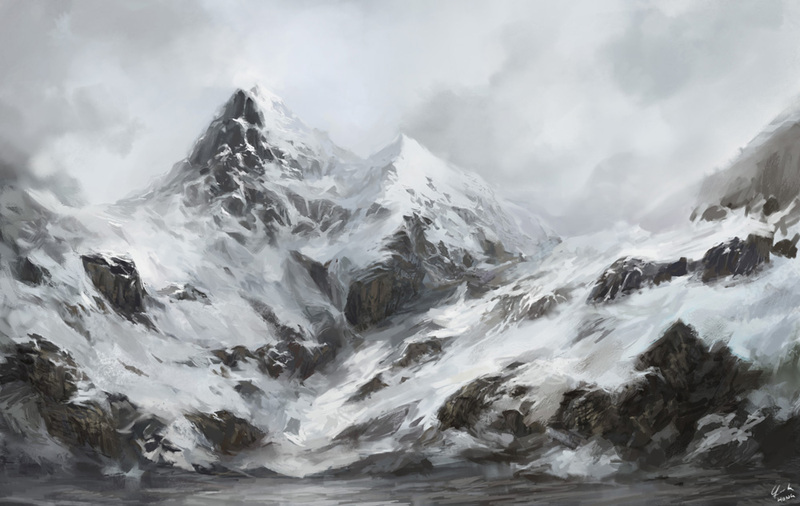 "Perhaps.." The character then settled down, draping his mass across the frosty stone earth. He didn't pay much mind to the newcomers' absence, so he let his head rest, and finally his eyelids fluttered over his chartruse gaze. Siren purred, nestling his muzzle into his flank. He was curled tightly, the light snow batting gently at his side. His ears were stiff, splayed atop his furry skull, and he now dreamed of sleep. Kendrick eyes kept shutting, but he refused to sleep until he saw his pack mates come back in one peace. Getting a little frustrated he shot up from the ground and started pacing back and forth, growling quietly to himself. " Where are they? What's taking them so long? Could they have been attacked?" he wondered to himself, coming to a halt he kept glancing at the woods, but it remained normal, nothing came out or in. "Stop thinking horrible things, Ken!" he muttered quietly, hoping he didn't disturb the Alpha. Sharon stopped and looked back. 'What are those sounds?' Her mind was all mixed up. She was starting to get a little scared, but tried not to show it. She quickly ran towards the sound. She was worried, and looked towards the cave for any explanation. Sharon turned to Amber and Vel, "do you know what's causing that noise?" She sighed, but she couldn't help being curious. She wanted to go meet with Siren, Macy and Ken, but she decided to see what the sound was coming from. She looked at the other females, and nodded. "I think we are going to have to go back, don't you think it's from somewhere inside the cave?" she took a deep breath, then started walking. Her feet were trembling a bit, but she couldn't turn back now. Daniel stepped into the unfamiliar area cautiously. There was a strong scent of wolf here, and more than one by the smell of it. So not wolf, wolves. She thought to herself. The shy wolf crouched low and hoped her yellow-orange coat wouldn't attract to much attention. The she-wolf crept forward, hoping she'd be in a safe place for now. His hackles were erect, prickling cruelly along his nape as an intruder's vivid odor began to waft into the great lad's nostril. The cheif again rose, his silver pelt glitsened with a light coating of snowflakes, and he gyrated his frame towards the scent. "Who goes there?" The creature erupted, a slight grimace playing on his maw. Daniel stopped in her tracks, she'd be spotted. Fear was the only thng that drove her to have enough courage to say, "My name is Daniel, who's asking?" She gave a small growl. Danny knew she was tresspassing in enemy territory and was not about to fight. She was a horrible fighter. "I'm sorry for tresspassing." She muttered quietly. The wolf emerged, a froth dripping from his chin. A fae was sighted, her golden fufraw emitting attention, and Siren simmered his snarl. With pricked ears, her narrowed his chartruese orbs. "You have ambled onto my territory, miss. Why have you?" He blinked once, slowly examining the female's posture. Daniel blinked. "I-I don't know." She admitted. "I guess you want me to leave." She said folding her ears back with a nervous smile. "But do you mind my asking, is this pack territory?" Daniel inquired. She desperately wanted to join but she had just barged straight into their territory an to her, asking to join rght now seemed impolite. He lowered his tassel, flicking his ears at the inquiry. With a firm nod, the brute unhinged his jowl to answer. 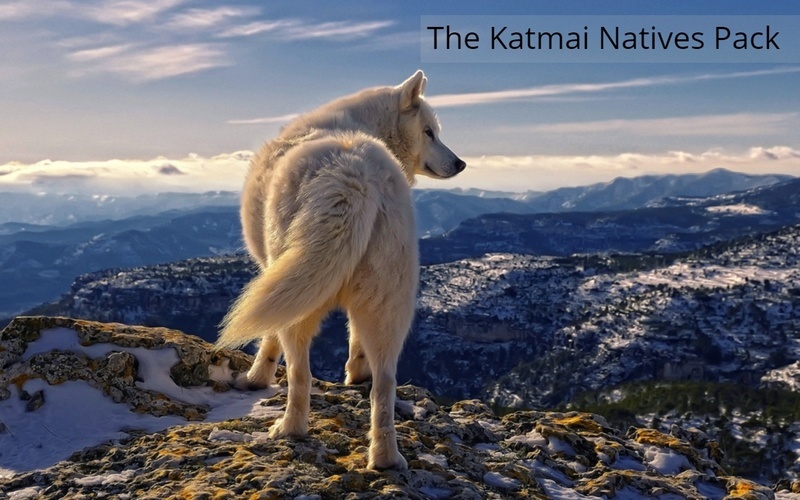 "The Katmai Natives Pack is originated here. Unless you have intentions on joining, I suggest you scadaddle." The Doyen watched from behind emerald eyes, shuffling his paws in dominance. Kendrick who was anxiously pacing back and forth, stilling wondering where the trios were at. He finally became annoyed and sat his hind legs down. He glanced at the Alpha, who seemed to have woken from his quiet slumber. Ken heard the Alpha say something, the mexican wolf raised his right eyebrow and turned to look at the direction the Alpha was looking. Squinting his emerald orbs, he spotted a wolf with a golden colored pelt, and judging by the intruders voice, it was a fae. Opening his eyes back up to its normal poise, he tilted his head, "Could it be another wolf who is looking for a pack?" mumbled Kendrick, eyeing the stranger with curiosity. "Oh joining would be wonderful!" Daniel's voice came out as a squeal. Embarrassed, she said "If you'll have me that is." She murmured. Daniel was determined to do something right this time and joining a pack seemed like a good way to start. Kendrick's lobes perked up when he heard the excited squeal of the fae. He turned to his side and chuckled lightly, not wanting to be rude and laughing out loud and disturbing the two. He pushed his hind legs, standing on all fours again, he slowly trotted to the two wolves, but stayed a few spaces back. Ken grinned to the female and nodded in greetings to the female, "Hello I'm Kendrick, Siren would love to accept you into the pack" he said kindly. He glanced to the Alpha Male, then back to the yellow canvas she wolf. Daniel flattened her ears at the wolf. Kendrick. What a funny name. She thought to herself smiling a bit. Feeling a bit more welcome, she said "I'm Daniel, erm, Kendrick." She couldn't stop herself from giggling for a moment. "I'm sorry, it's just I find Kendrick a little funny." She said giggling again. Kendrick nodded and kindly said, "Nice to meet you Daniel." He stood there for a moment giving her a plain face while she was giggling at him. When the she wolf Daniel explained to him on why she was giggling, he smirked at her and said, "ah yes.. I guess my name is kinda funny." He quietly watched her as she continued to giggle, he tried his best not to laugh along, and decided to glance away from her and turn his attention to the woods. "I'm sorry, I'm sorry." She said, finishing off her giggling. "So, Kendrick, what's it like in this pack?" Danny asks. Daniel wondered if it was a friendly pack. "Oh, you can also call me Danny." She tells him. Kendrick glanced back at the femme and said, "No need to apologize, I don't mind it at all." Ken gave her a smile to reassure that he was fine with it. "So, Kendrick, what's it like in this pack?" Kendricks lobes flicked to the femme, "Well I haven't exactly been in this pack that long, but it's really big and I like it alot. There are other members as well, Sharon, Amber, and Veleno. Their out exploring at the moment but I'm pretty sure you'll meet them soon." When she said he could call her Danny, he smiled and said, "Ok, and you can call me Ken." "Alright, Ken." She smiled. "What should we do? I'm bored." She gave him an exagerated sigh. Daniel began to pace around in circles, deep in thought. "Any ideas?" She asks. "What should we do? I'm bored." Ken looked away from Danny and took a moment to think of something both of them should do. When an idea sparked in his brilliant mind, he glanced back at the fae and said, "Well Danny we can go find the trios." Remembering the Alpha was still near them he said, "But I guess we'll have to wait for the Alpha to fully accept you, before we wander off and find the girls." Danny barked with excitement. "Oh yeah." She said, looking at the other male towering over her. "Wait, find other wolves, you mean?" Danny spoke shakily. "I don't think that a good idea..." She said looking away. "But I'll come if you're sure they're nice..."
Kendrick smiled when she barked with excitement at first then his eyebrows raised when her tone became shaky. He laughed a bit and said, "Don't worry Danny, their.. nice." It took a few minutes for him to organize their personality in his head, then he spoke again, "Well I definitely know that Sharon is very nice, so no need to worry about her. I haven't really spoken to Veleno but she's quiet, and Amber..." He was now thinking back at the time she was growling towards the new she wolf Veleno, snapping out of that thought he smiled at Daniel again and said, "She's a interesting character, but I assure you she won't bite." Danny narrowed her eyes. "If you say so..." She mumbled. "Let's go then, lead the way." She tells Ken and waits for him to go. The fae had no idea where she was going and wasn't entirely sure she could trust Kendrick yet. "Let's go then, lead the way." Kendrick sighed and said teasingly to the fae, "Okay I hope you can keep up with me." He lowered his nostrils to the ground, sniffing around for a scent. He then lifted it in the air and inhaled, he caught a faint scent of the trios, and smiled. Looking back at Danny he said, "Found their scent, it's this way" turning his gaze back to the woods, he bounded off, leaving paw prints behind him for Daniel to follow.